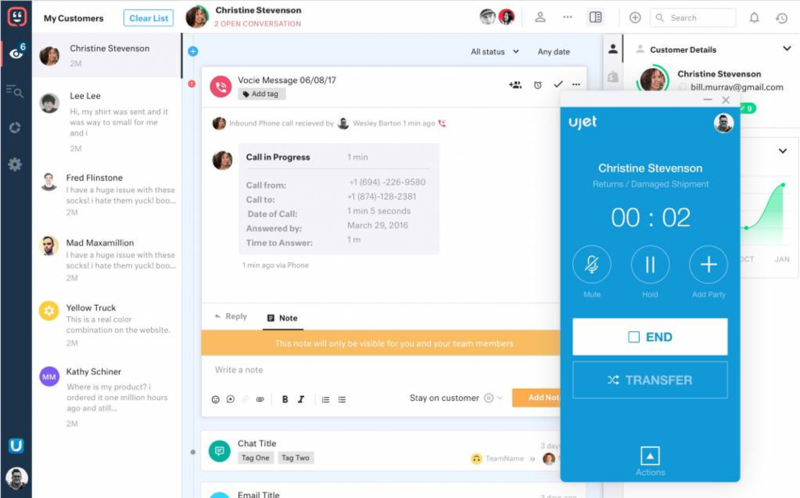 UJET offers a holistic platform for voice and chat channels to provide streamlined, personalized customer support. The UJET voice channel has a seamless integration into the Kustomer timeline, enabling your sales and support teams to boost productivity, shorten first call resolution times and deliver a higher level of customer service. Using UJET in Kustomer allows your sales and support teams to view, search and report on historical call data in a customer’s timeline. Users can also listen to call recordings and send an email or SMS follow-up all within the same conversation view. During the call, Kustomer will automatically add events to the timeline to indicate what’s happening. If you are not available, we also add a link to the voicemail (and transcript, if available).